Our school, instead of usually taking us to theme parks or the rides at malls, has planned a 5-day trip to Kuala Lumpur, Malaysia. A) We did not want to go somewhere alone for 5 days, without our parents. B) We already knew what the answer would be when we would go home. “NO”. C) We had just missed a field trip and now we would have to wait till next year. After seeing the movie “The Conjuring”, I avoided doors, closets, taking long showers, staying somewhere alone for more than 30 seconds, thinking about the scariest parts of the movie and a lot more. But that was only for a few days, thankfully. I was already getting tired of my father doing “Boo!” to me and me screaming. I got a look that said “Why would you scare me like that? “, plus a shove for all my trouble. 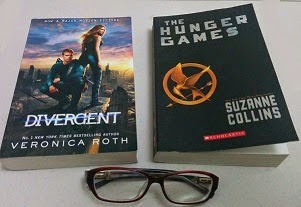 The latest book I have read is “The Hunger Games”, by Suzanne Collins. In a way, the writing and the plot resemble “Divergent”. Everything is full of action. In “Divergent”, Tris knows how to use a gun. In “The Hunger Games”, Katniss uses a bow and arrows.